Some of these I already do, or attempt to do. I try hard to ask interesting questions that pertain specifically to the person I’m speaking to, but these quick tips are great reminders. It’s the 16th and that means I’m on the downhill side of my goal to blog every day in November. So, far I feel pretty good about achieving this goal every day. I tend to write more of these at night and I think I would prefer to write them in the morning, but somehow I seem to have more to say at night. At the moment, I doing more stream-of-consciousness blogging (pantser!) then planning which is probably why it’s easier to blog later in the day when I have something to comment on about the day’s activities or thoughts that have come up. I think for the last half of the month I may try to plan some topics ahead of time and then try writing in the morning to see if that style works better for me. Today I feel a little a loss for a writing topic. I did look at my little “Instant Interviews” book for inspiration, but somehow it all feels so personal (too personal) to put out in to the Interwebs. So, maybe my next project will be just writing for me. Maybe it turns into a scrapbook or something else. I guess that’s the dilemma of social media and the Internet. How much is too much to share? Where’s the line between public and private? There’s no getting it back once it’s out there. My husband deleted his Facebook account after watching a 60 Minutes report on just how much information Facebook has on its members and how they sell that information. That’s not real surprising though, is it? I mean, they’re making money some way and you can’t tell me ads alone are paying for all that square footage in Silicon Valley. What was eye-opening to me was all the information they have on NONUSERS. Yikes. How is that even possible? So, it’s days like this I feel like going to live in the back woods with no Internet service and leaving the rest of the world behind. Don’t worry. I will still have indoor plumbing and electricity. Let’s not get too crazy. It’s time to talk about Hallmark Christmas Movies. It’s not even Thanksgiving yet, you say? Well, Hallmark’s been airing (and I’ve been taping) Christmas movies since late October! I already feel like I’m behind. I don’t have to think too much. I know there are whole channels devoted to airing “edgy” and challenging content. That’s fine, but with so much to worry about and think about in our world today, I don’t need to be challenged in every show I watch. It’s nice to turn that all off for a couple hours. There’s always going to be Christmas music. I mean, Christmas music! It’s sweet, it’s perfect, and it’s perfectly matched to the story and gives me warm fuzzy feelings inside. The stories are comfortable, like an old sweater. More often than not, I can tell where the story is going. Sometimes there’s a twist I didn’t see coming, but I’m good either way. I like the people starring in the movies. Hallmark has a reliable stable of actors and actresses, so watching these movies year after year starts to feel like revisiting old friends. Am I the only person who is happy when I see an actor I like get a job? The decorations. Honestly, can just one of those set decorators come decorate my house for Christmas? They are perfect to watch while wrapping presents. Because of #1, it’s pretty easy to wrap a ton of presents and not miss much of the movie between cutting, taping, and tying ribbons. There’s always a happy ending. In this bizarro world, where it seems each day I’m surprised by the terrible things going on, it’s nice to watch something I know is going to end happily. It’s a nice respite. Do you enjoy the guilty holiday pleasure that is a Hallmark Christmas Movie? It’s okay I’ll keep your secret! Well, here I am at the end of the day again with barely any energy to write. But, I promised myself to write a blog post each day in November, so, by golly, I’m going to do it. Let’s talk about how it’s not wise to put the things you know need to get done until the end of they day, unless that’s when you have energy. I use to be a night owl. It still comes out sometimes, but it use to be if I didn’t get myself to bed by a certain hour I might as well stay up because I’d be awake until 2am anyway. I use to get a ton of crafting done in the wee hours and pack many boxes during moves in the late night hours. Time though, they are a-changin’. The older I get the more I realize I need to manage my energy and not my time. I am tired by the end of the day. I am ready for bed at 10pm. (Now, of course, I wake up at 3am, but that’s a different story.) I tend to have more brain power earlier in the day. This would be a good time to write blog posts, but I’m also enjoying seeing where the day leads and what comes to mind for a post. I’ll find a happy medium some place. But, for now, I know that writing posts after 9pm just make me more tired and frustrated with myself. 110 women are going to Congress. These are women from all over the country. These are women from different political parties. These are women from different races, religions, creeds, and preferences. Women make up over half of our country’s population, so there’s a ways to go for a truly representative government, if that’s something that’s even possible, but tonight I am encouraged. I do not like the political strife in the atmosphere these days, but seeing people galvanized to take part in our democracy makes me very happy. I think this is an election that will be felt for generations to come. I’m not gonna lie, Election Day is one of my favorite days. 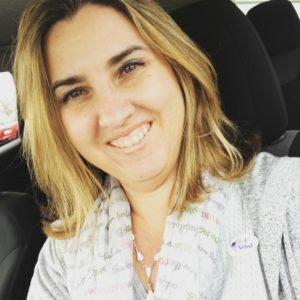 I get to vote! One of the first things I did when I turned 18 was to go with my dad to the Election Board to register. It has always been a big deal for me. I feel grateful to live in a country where I have a say in the government. Not all of my female ancestors had this privilege. There are so many who came before me that didn’t see the realization of their dreams to have a voice in our government. I owe it to them to take advantage of my vote. As the wife of a veteran, I recognize there are men and women at this very moment fighting for the right of others to have a say in how their countries are run. And, there are those who will never have the opportunity to make their voice heard. I owe it to them to not take this responsibility for granted. Now, I’m not blind or crazy. I know these are politically charged times. I voted in enough elections now to know that my candidate doesn’t always win. And, you know what? That’s okay. It doesn’t make my vote any less valuable or important. I don’t believe the intent of our Constitution is for us to get our way all the time. In fact, I think it’s the opposite. I think we are suppose to have people from all walks of life with all different opinions to create legislation that works for everyone and to get there it takes compromise. It’s not a perfect system and certainly many of our current congresspeople don’t see it the way I do, but I believe we can keep moving forward and working together, but it really only works if we vote for the things we believe in. It was the first time I wondered if by putting “God Bless America” in my status if people would assume I voted a certain way. I live in a mostly Republican state. I’m a Christian. I live in the middle of country, one of the “flyover” states. I would encourage you not to judge a book by it’s cover. I don’t think you can assume how anyone votes unless they tell you. Don’t assume or get mad at anyone over their vote or what you think their vote is for. The truth is I voted for Republicans, Democrats, and Independents. Like I said, I think we all need to work together. We are the people in “We, the People.” God Bless America. So, in Sunday School we’re beginning to study Hebrews. This pleases me because Hebrews is probably my favorite book of the Bible. It’s full of uplifting and encouraging passages to inspire you, but also challenges you to be a better Christian even when you can’t (and probably won’t) see the fruits of your labor. Betty Vyse – Betty was the Sunday School Superintendent at our church when I was little. She was a force of nature! To my little eye, she ran Sunday School with so much organization and she was fun! I’m pretty sure it was her who taught me “The B-I-B-L-E” song and the little ditty I still sing when I’m trying to remember the books of the New Testament. Ruth Rawdin – She was one of our upper elementary grade Sunday School teachers. You felt grown up when you got to her class. At that time, boys and girls had a separate classes and I loved being in that room full of girls. We also got a PIX comic/handout each week and I couldn’t wait to go home and read it. Era Preston – Another force of nature! She loved God and was one of the strongest women I’ve ever known. She was the epitome of a servant leader. She could preach a sermon and then serve 12 for dinner like it was nothing. She held our church together during some very rough times and she looked good doing it. She was one of the first women I heard address domestic abuse and say that no woman should be treated that way and that if you were in a relationship like that to get out. Jan Holbrook – Jan was our 6th grade Sunday School teacher and the mother of one of my best friends growing up. (Hi Holly!) She would tackle subjects at our request. (Ever try teaching Revelation to sixth graders?) And, she always made me feel at home when I was with their family. A wonderful example of unconditional love. This is very short list (and doesn’t even include my family) but these were some of the women who came to mind today as I was in prayer. I thank God for them (and all the ones not named) and know I wouldn’t be where I am today with their influence and their tireless efforts. We’re told that we’re never alone—that Christ is with us always. Thinking about coupling that closeness with Christ and the great cloud of witnesses lifting me up and encouraging me brought me a real sense of comfort and peace today. I hope it brings you comfort and peace too. Not only is it fun to vote, it’s great way to find some new books you didn’t even know were out there. I work with lots of children’s book authors, so I’m especially happy to see someone I know on the list this year! 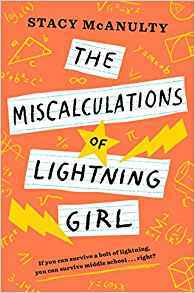 Congrats, Stacy McAnulty! I know Stacy through 12 x 12 which is a challenge for picture book writers to write 12 picture book drafts in 12 months, but clearly Stacy is also killing it as middle grade writer. I know how hard she works on her craft, so it’s wonderful to see that effort recognized and appreciated. Looking at these lists reminds that I don’t have nearly enough time to read all the books I want to read. Which books will you vote for? It’s the first of November. For writers around the world, it’s the beginning of a big month: National Novel Writing Month. These writers commit to writing 50,000 words in one month which is essentially the first draft of a novel. While I’m not yet convinced I have a novel brewing inside of me, I do know that I like to write. I also know that I have been sorely lacking in the creative department over the last several years. So I’m going to write a blog post a day in November. Some will be longer than others. Some will be about things going on currently. Some will be about personal history. 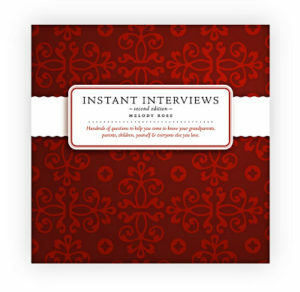 For years now, I’ve been wanting to use this little book, Instant Interviews by Melody Ross, to get some stories down. (I can’t even find the book in print anymore and the company who originally published it is out of business, so, yeah, I’ve been thinking about this for years.) Some posts may just be about being grateful since we have a whole month of gratefulness here in the U.S.
As a virtual assistant/project manager, I spend a lot of time writing for other people and in the “voice” of that particular organization. So it will be fun to a little more free and write maybe without so much pressure…maybe. I just know I have some things/thoughts/theories to get out of me and I’m ready to begin.